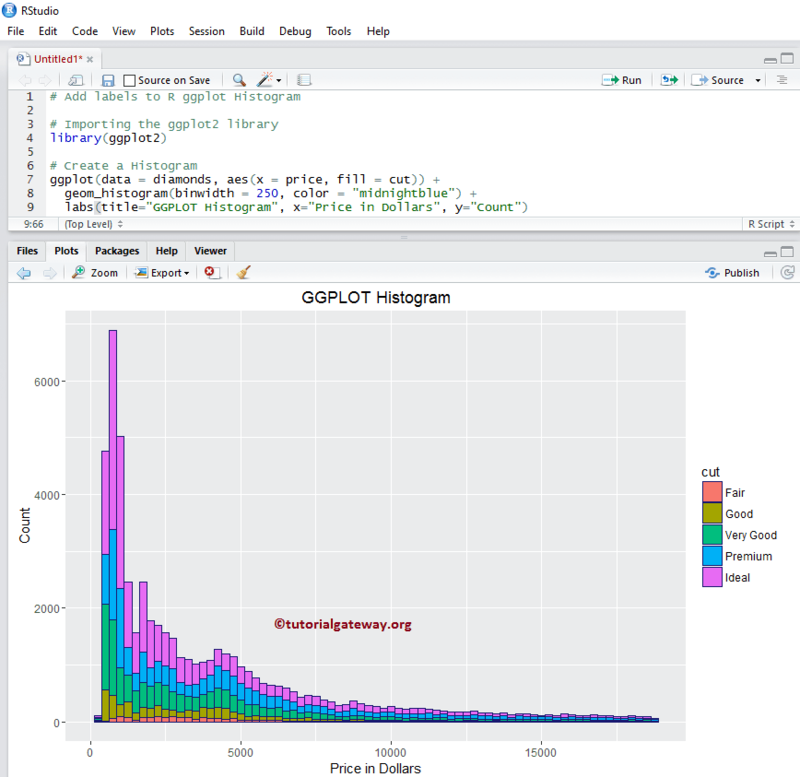 The R ggplot2 Histogram is very useful to visualize the statistical information, that can be organized in specified bins (breaks, or range). 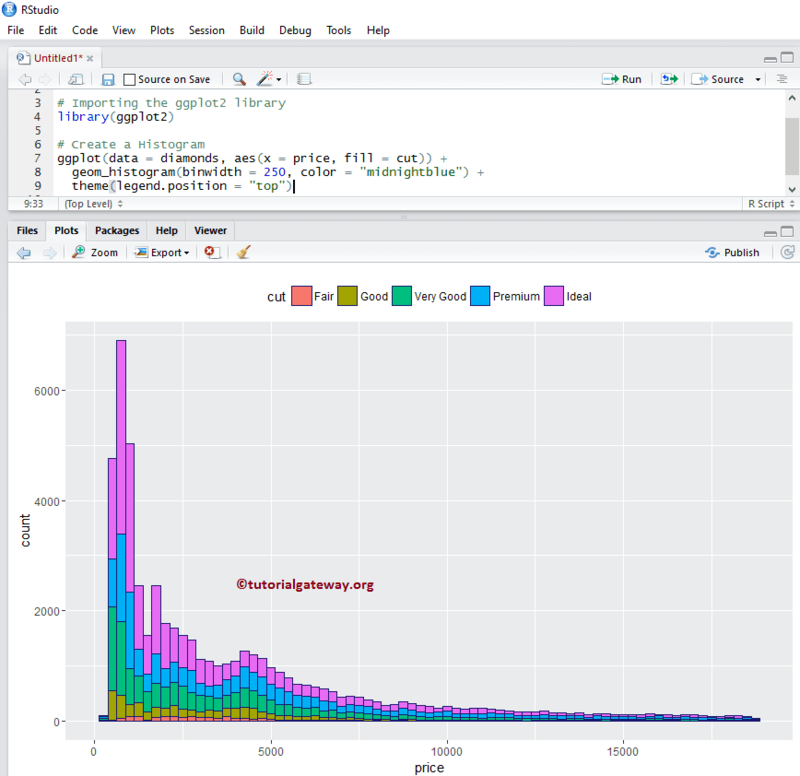 Though, it looks like a Barplot, Histogram display data in equal intervals. 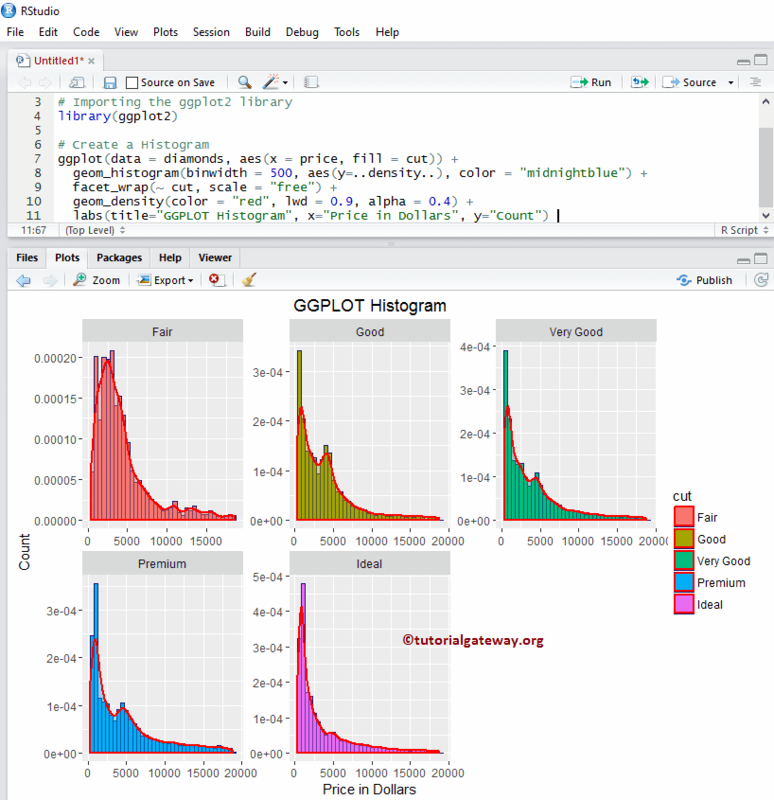 In this article we will show you, How to Create a ggplot Histogram, Format its color, change its labels, alter the axis, adding the density curves, and plot multiple Histograms using R ggplot2 with example. 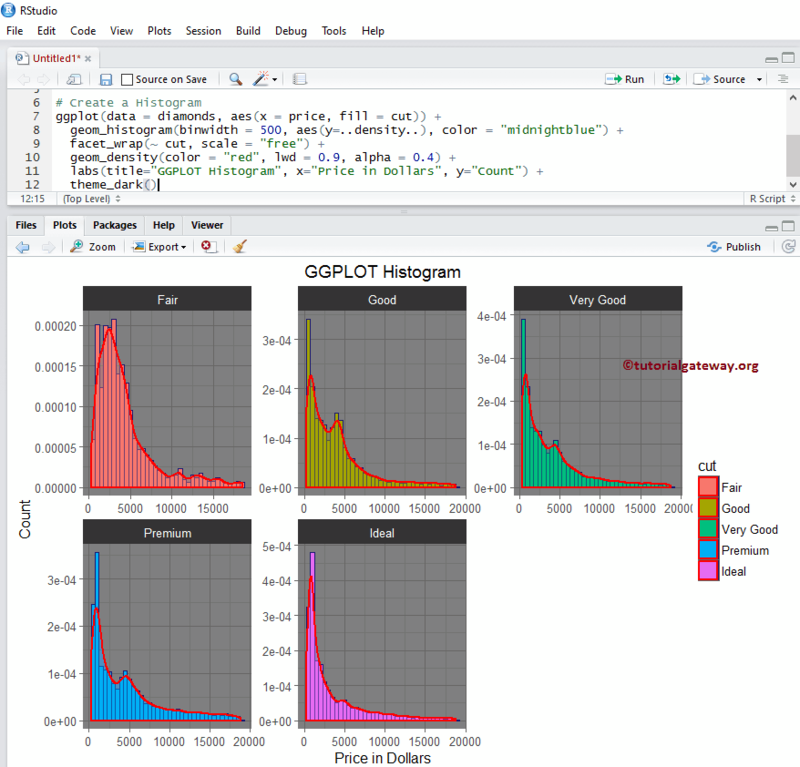 TIP: ggplot2 package is not installed by default. Please refer Install R Packages article to understand the steps involved in installing a package. 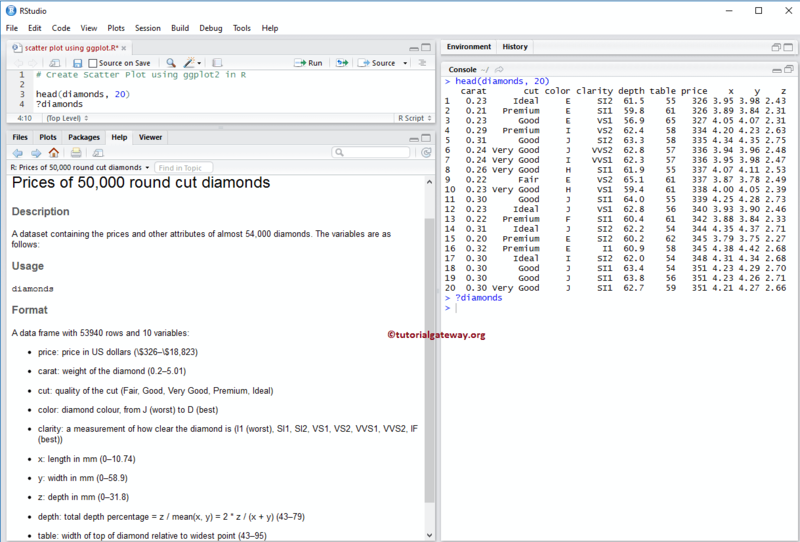 In this example we will show you, How to create a Histogram using the ggplot2 package, and we are going to use the above shown diamonds data set, provided by the R Studio. 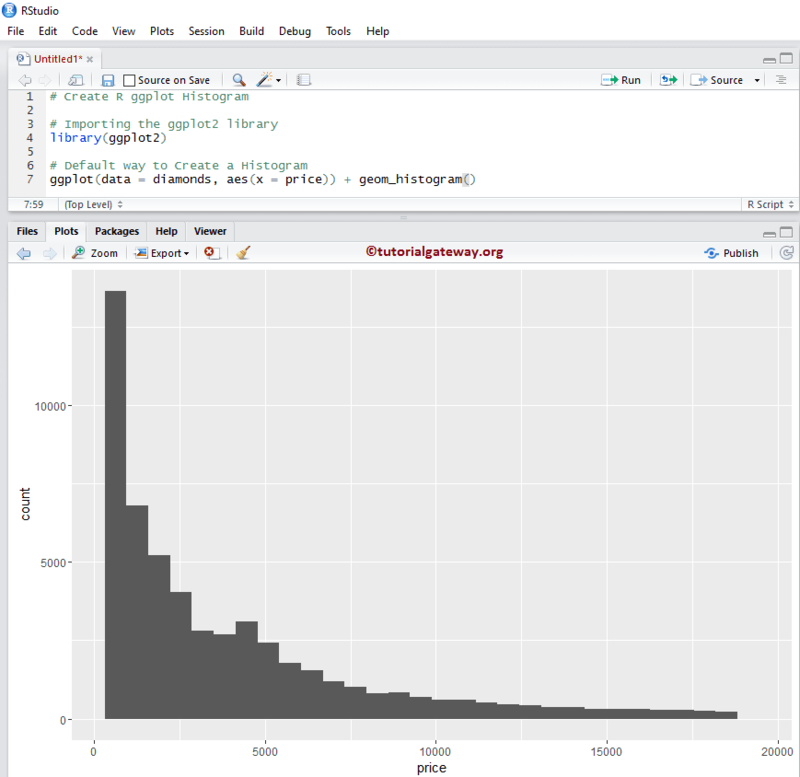 In this example we will show you, How to change the number of bins (range, or breaks) in a Histogram. 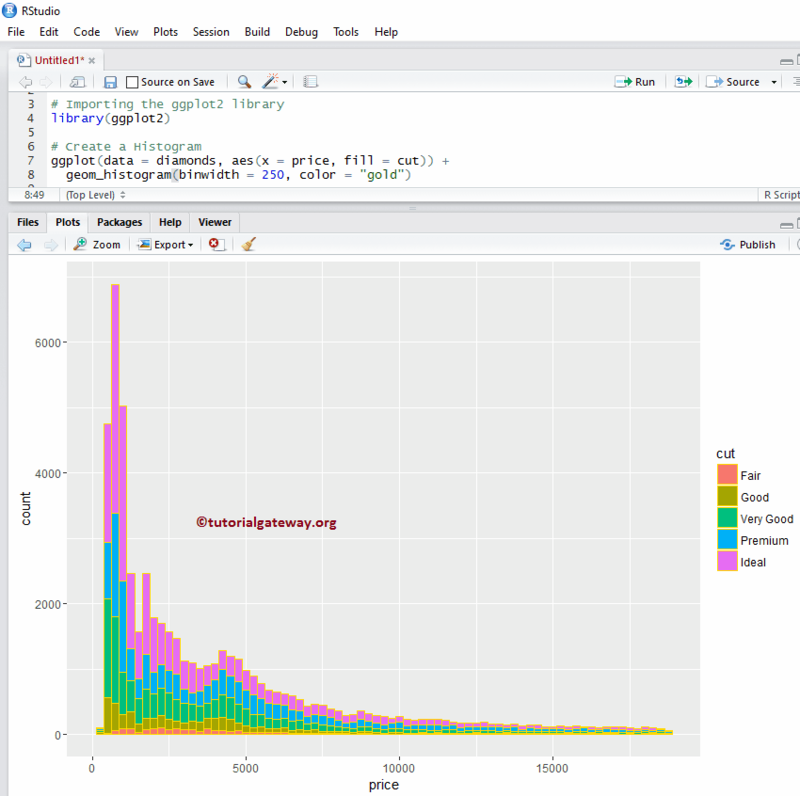 By default, geom_histogram() provides 30 bins but, you can alter the value as per your requirements. 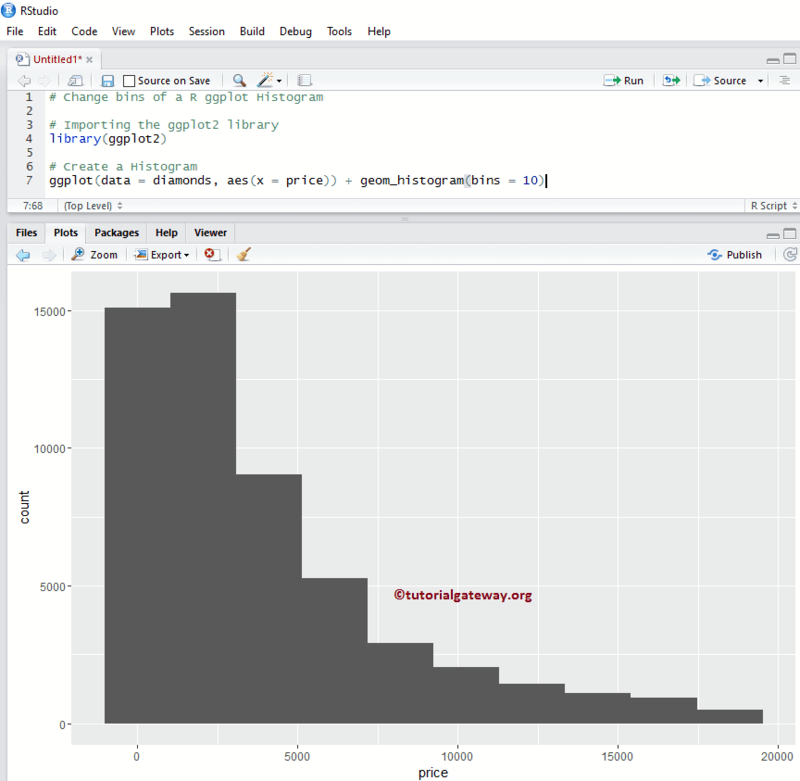 This example will show you, How to change the number of binwidth (overriding the bins) in a Histogram. 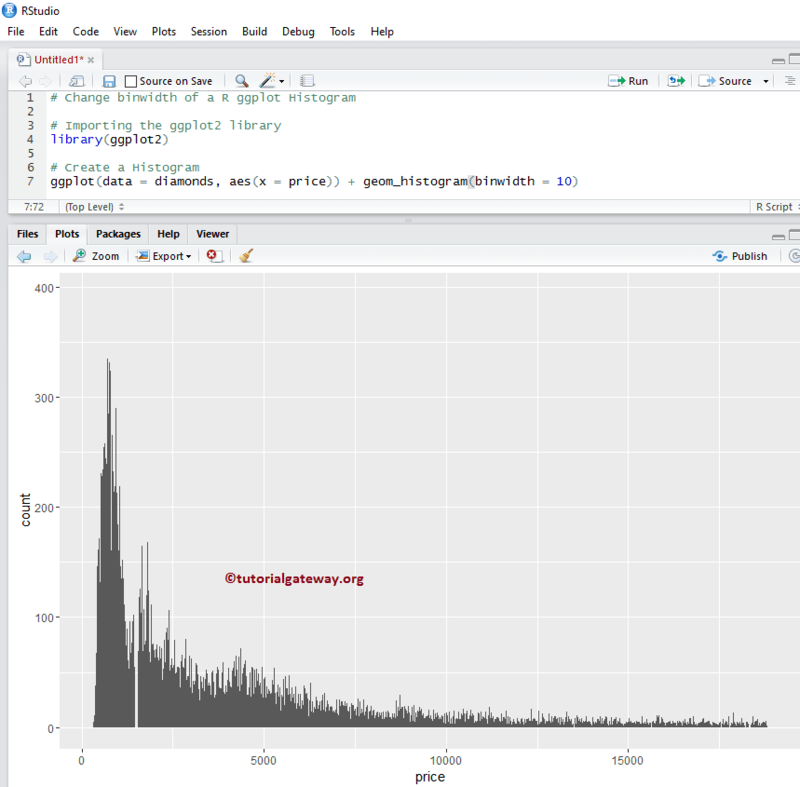 TIP: Use bandwidth = 2000 to get the same histogram that we created with bins = 10. 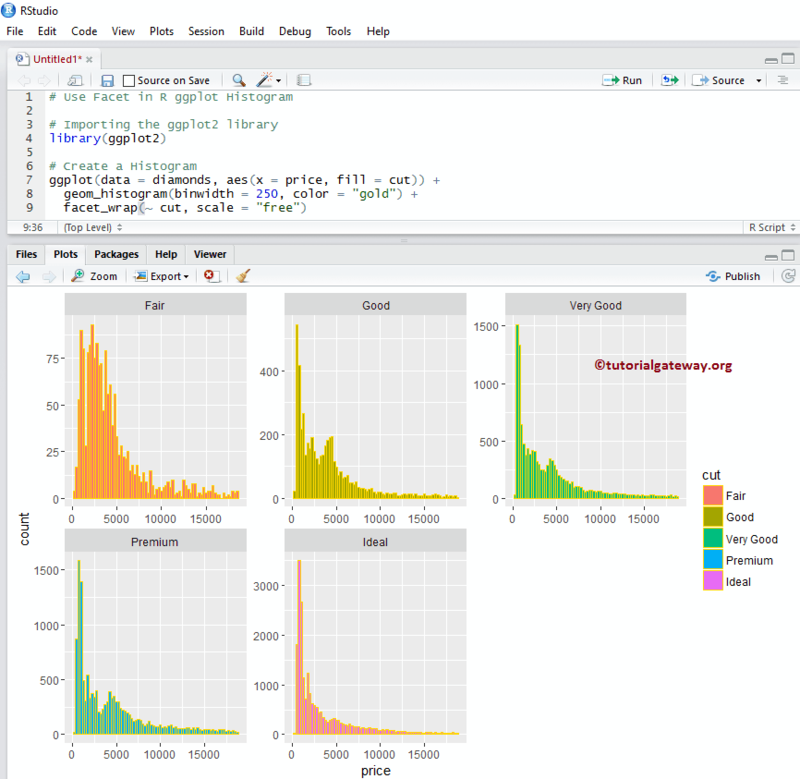 In this example we will show you, How to change the color of a histogram drawn by the ggplot2. color: Please specify the color you want to use for your bar borders in a histogram. For example “red”, “blue”, “green” etc. In this example we are assigning the “red” color to borders. fill: You have to specify the color you want to use for your bar. In this example we are assigning the sea green color. 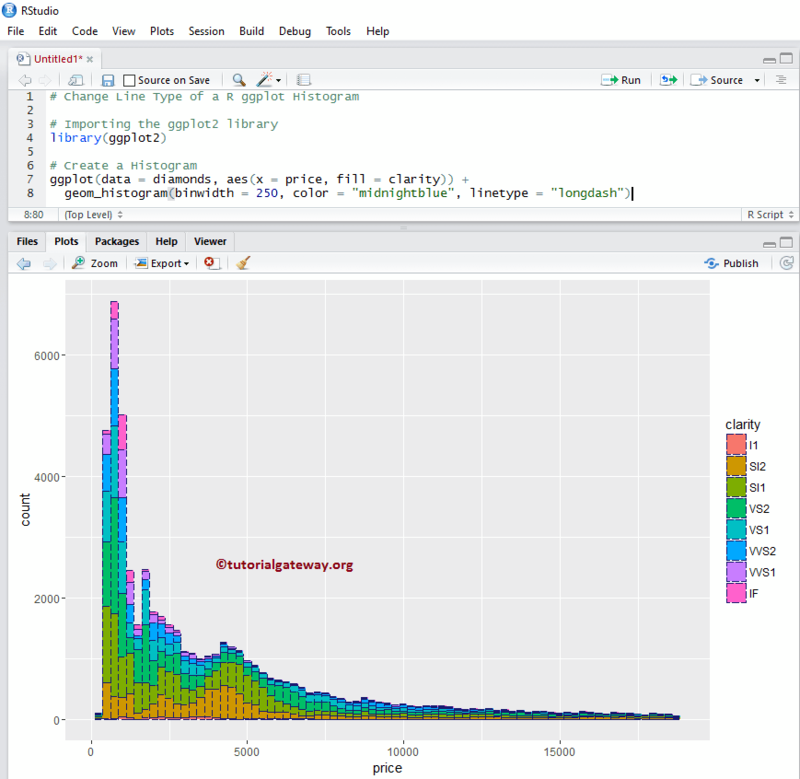 In this example we will show you, How to change the color of a ggplot2 histogram based on the column data. In this example we are assigning the cut column as fill attribute. You can try changing it to any other column. In this example we are changing the fill attribute to clarity, and removed the borders of each bar. 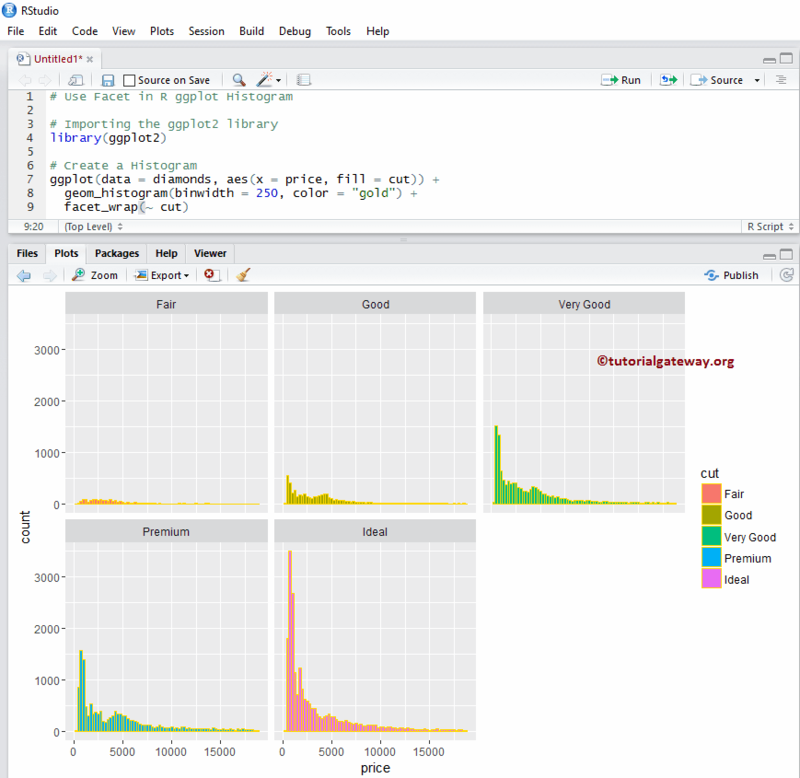 In this example we will show you, How to change the border lines of each bar in a ggplot histogram. 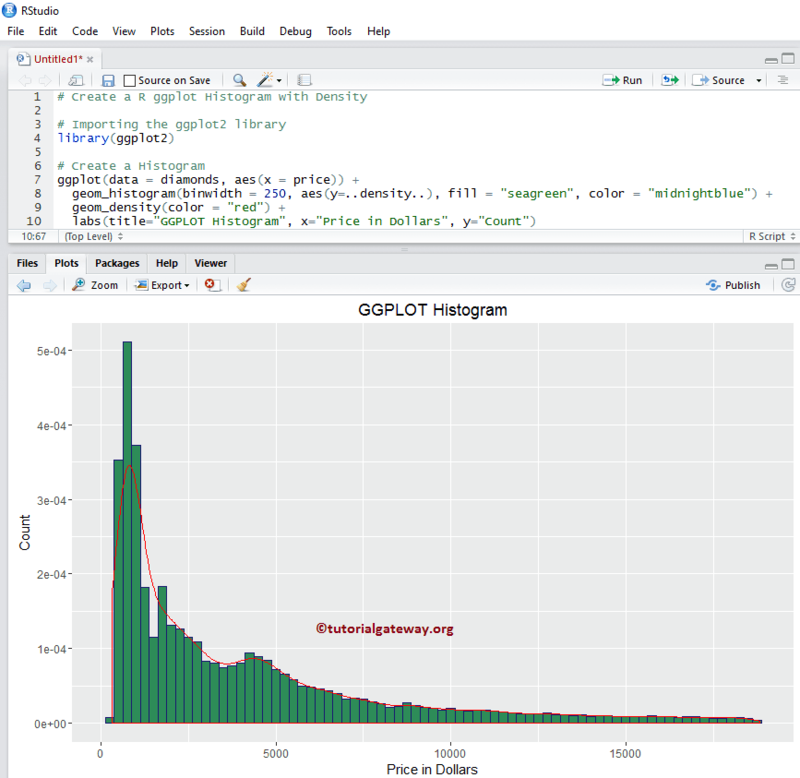 By default ggplot will position the legend at the right side of a Histogram. In this example we will show you, How to change the legend position from right to top. Remember, You can use legend.position = “none” to completely remove the legend. 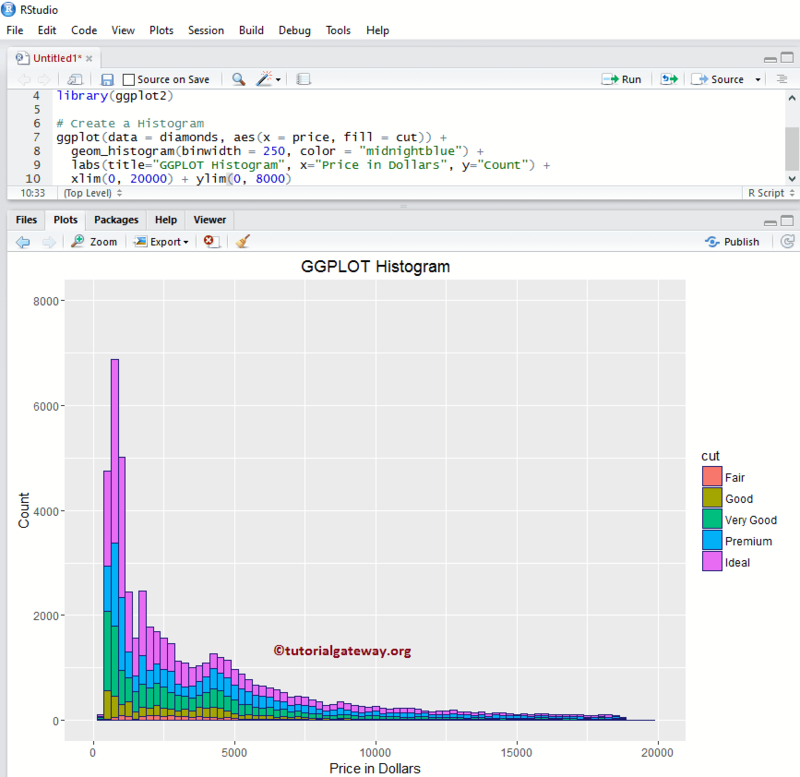 This example we will show you, How to draw multiple histograms, by dividing the data based on column value. By default facet_wrap() will assign the same y-axis to all the histogram but, you can change it (giving independent axis) to each histogram by adding one more attribute called scale. Frequency will count and give us the number of data points per bin. In real-time we may interested in density than the frequency based histograms because, density can give the probability densities. 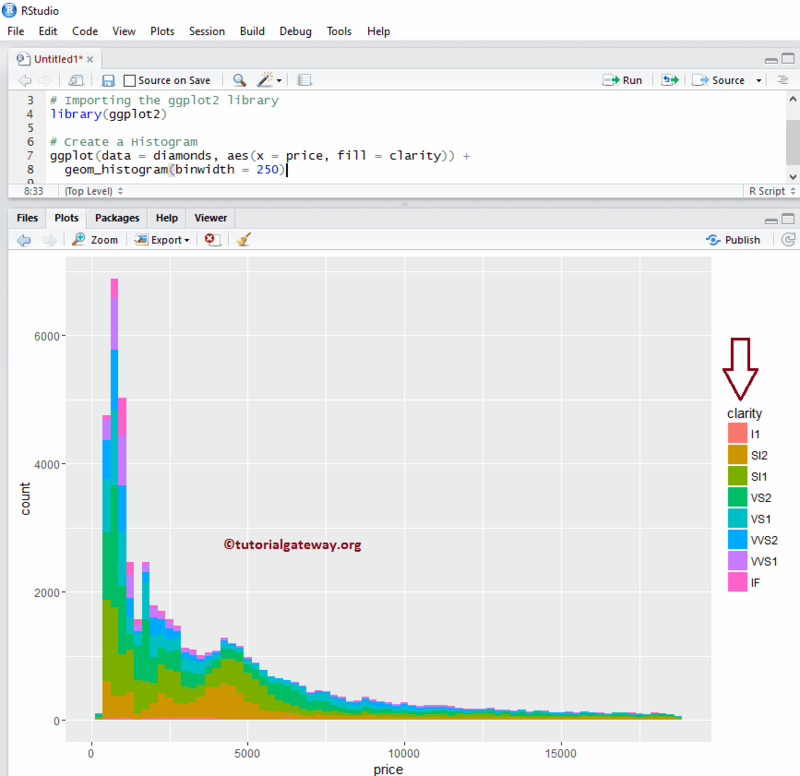 In this example we will show you, How to create a ggplot Histogram against the Density using geom_density(). In this example we will show you, How to draw the density line to multiple histograms drawn by the ggplot2.